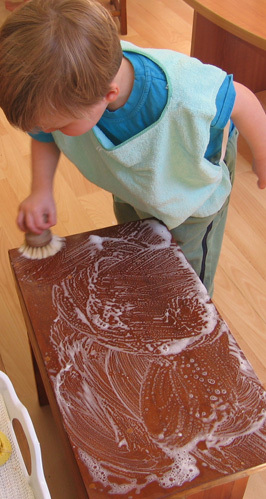 Montessori identified four phases in a child’s life: Birth to 6, 6-12, 12-18, 18-24. Many psychologists have described these different phases but it is only Montessori who has given a way to respond to this understanding as a means of education and in this way has redefined education as an ‘aid to life’ suggesting that if we support the natural development of children at each plane then we will optimise development for the whole human being. She suggested that there is a unique time in each child’s life when he is most able to take a particular developmental step. It is imperative that children are given the opportunity to grasp these opportunities at the right moment if they are to fulfil their individual potential. In the first six years of life the young mind just seems to soak up everything in the world around him. It means that a new born baby can learn any language and adapt to any culture simply by living. Montessori suggested that much emphasis must be put on education in the first six years of life, while children learn with total ease. From the moment they are born small babies strive to orientate themselves and explore the things in their world. They reach out to abstract meaning from everything they experience, they are driven to be independent and want to find a way to communicate with the people around him. They are urged to manipulate things with their hands in order to know what they are, to concentrate on the task in front of them and to repeat things in order to make everything that they do more and more perfect. These developmental drives are all a part of the natural behaviour that humans beings take with them through life and that help babies to develop and adapt to their new world. Children have periods of time when they are particularly sensitive to certain things going on around them, During those first six years of life they are driven to seek activity that helps them to learn their language, co-ordinate their movements and develop a mind that can make sense of their world. These ‘Sensitive Periods’, last for a limited period of time and fade by the time children reach six. They provide a timetable for natural development and the Montessori approach puts great emphasis on supporting each child’s individual developmental timetable during the first six years.